□ ESOTERIC TITLE: The Daughter of the Firmament: the Dweller between the Waters. THIRTY-TWO PATHS OF WISDOM: The Twenty-eighth Path is called the Natural Intelligence, and it is so-called because through it is consummated and perfected the Nature of every existing thing beneath the Sun. The Path of Tzaddi, THE STAR, connects Netzach (Victory) with Yesod (The Foundation). It is a very powerful Path which points out the way in which the Divine Energy inherent in each individual is properly approached. The letter Tzaddi means fish hook, implying meditation, a process closely linked with the use of imagination. In these terms meditation is described not as taking-out of something, but as a putting-in (merging) of two streams of individual consciousness with the greater consciousness. And while this is a path of primal intuition, the vessels represent a separation and then reintegration of the Chokmah force (feelings and intuition, at this level) and Binah force (intellect). The symbolism of the fish hook in meditation is easily extended to the Tree of Life: The Hook (Tzaddi, THE STAR) is put into the waters of Mem (THE HANGED MAN) to catch the fish (Nun, DEATH). Water is, again, a symbol of consciousness. As we experiment with meditation and imaginative visualization, casting ourselves into the Universal Sea, we seek an understanding of the very processes of life and death. The Thirty-Two Paths of Wisdom describes this Path as the Natural Intelligence, suggesting the raw forces of nature attributed to Netzach; the Elohim (Gods of Netzach) are synonymous with nature itself. Moreover, this Natural Intelligence is related to the energies symbolized in another card, STRENGTH. The number of THE STAR, 17, reduces to the number of STRENGTH, 8. That card represents the conscious control of Kundalini energy, variously described as solar and as sexual. We recall that the serpent Kundalini (the same which tempts Eve on the Tree of Knowledge of Good and Evil) is said to be "coiled in Yesod," although when it is shown on the Tree of Life it touches each and every Path. As we encounter the Kundalini force, the sexual energies in ourselves, we approach the Greater Mysteries of Tiphareth, the Solar Logos which is the central star of our existence. The process of approach is a kind of yoga, involving the ennervation of centers of energy. It is this energy which we use in the meditation process; it is both the means and the goal of enlightenment, for, as the text states of Tzaddi: "Through it is consummated and perfected the Nature of every existing thing beneath the Sun." THE STAR is the means of perfection; it is the method. 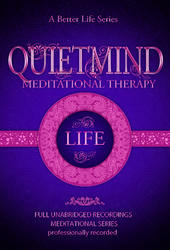 As Case states of this method: "Meditation is really a function of the EGO, which raises to the conscious level the powers of the automatic consciousness of Yesod. . .however much it may seem to us at first that meditation is a personal activity, when we really succeed in meditation we discover that what happens is not that we meditate, but rather that we are meditated. "120 The idea is that the Higher Self (what Case is calling the Ego) brings the Personality into meditation. The "fish hook" is partially the search of the Personality consciousness for reality in the context of meditation, but it is also the angling of the Higher Self to pull the Personality up from its depths of self-enclosure. The figure on this card is the most pure manifestation of the Great Mother at the level of the Personality, and prior to its enclosure in matter. For this reason it is completely unveiled: it is the perfection of the physical form of nature, i.e., of "every existing thing under the Sun," meaning below the level of Tiphareth. This is the same figure first found in THE EMPRESS, robed and crowned; it is the same figure as THE HIGH PRIESTESS: it is the same figure found in THE UNIVERSE. The Golden Dawn representation of THE STAR carries more specific information about this Path than the others, although it is hidden in the intricacies of number. 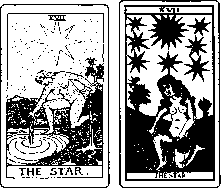 On this card the seven primary rays of the star, and the fourteen secondary rays add up to 21. This is the number of Eheieh, the God name of Kether, telling us that the relationship of this Path to the Godhead is far more direct than is obvious on the surface. Moreover, the Golden Dawn imagery carries with it an explanation of why THE STAR, transposed with THE EMPEROR by Crowley, belongs firmly planted on the Twenty-Eighth Path where tradition has placed it. The Key to all of this is the two trees on either side of the female figure. These are the Tree of Life on the right, and the Tree of Knowledge of Good and Evil on the left. Biblical scholars will immediately recognize the symbolic trees described in Genesis; Adam and Eve were forbidden the fruit of the latter tree, though not of the former. The Bird of Hermes above the Tree of Knowledge of Good and Evil (the Ibis) amplifies the meaning of the Tree in this card. It is a reference to THE MAGICIAN, the card of Hermes-Thoth-Mercury. In Hebrew the word kokab means star, but more specifically it means Mercury. Thus we understand that it is necessary to apply the willpower of the Magician, the directing force in meditation, if we are to learn the lessons of this Path. The Zohar, speaking of the Tree of Knowledge of Good and Evil explains that if a man lives uprightly, it is a Tree of Good, but if he lives unjustly, it is a Tree of Evil. "124 This does not imply the acceptance of any social doctrine or law, or any rule of social conduct. It means simply functioning in accordance with the Universal Will. And here in the card, we see that the lower branches of this Tree are a reversal of the principles symbolized by the branches above. 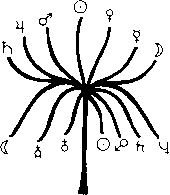 Each branch represents one of the seven Planets (six around the Sun), with Saturn representing all three Supernals (Figure 30). So we understand that this Tree, related to the expulsion of Adam and Eve from the condition of "heavenly bliss" symbolizes the dualities of good and evil, pain and pleasure, harmony and disunities of the human condition. The bird above, while a reference to THE MAGICIAN and the will, points out that wisdom emerges from a right understanding and control of the daily aspects of our lives. The Hermetic Mysteries serve to explain all that is called good or evil in our lives, and to help us to transcend the limitations which are imposed by these qualities. It will also be seen that the Tree of Knowledge of Good and Evil is toward the side of the Pillar of Severity. Its opposite, The Tree of Life is on the side of the Pillar of Mercy, for it is a gift of God balancing the severely polar lessons of the other Tree. 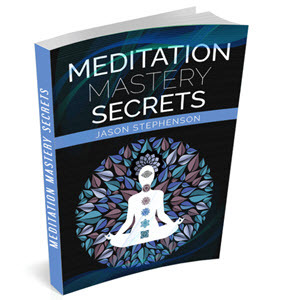 The very practical point implied here is that we must continually refer the lessons of the inner worlds, the results of meditation, to our daily lives, and vice versa. What is shown in this Key is the Garden of Eden, a state of beginnings. But a complicated question arises as to why that Garden should be represented in a card so low on the Tree of Life and, indeed, why it should form one of the primary Paths of the Personality. This is explained by a reference of this Path to a higher Path, that of The EMPEROR. The correct Hebrew title of this card is D'ODIDn (ha-kokabim), meaning the Stars, rather than the Star. Case made this point, noting that some early French and Italian decks use the plural Les Etoiles and Le Stelle for this reason.125 And while Case did not expand the idea, admirers of Crowley will immediately recall the statement from his Book of the Law, causing him to reverse THE EMPEROR and THE STAR, that "Tzaddi is not the Star." Indeed it is not a single Star, nor is it THE EMPEROR. Yet there are many Qabalistic ways in which THE EMPEROR (Heh) and THE STAR (Tzaddi) correspond. One such link, again demonstrated by the Master of Gematria, Paul Case, has to do with the fact that the Hebrew ha-kokabim has the same numerical value as tiTKn "pN (ehben ha-Adam), The Stone of Adam.126 This is a symbolic reference to the union of the Supernal Father, Chokmah, with the Sun, Tiphareth i.e., The Path of THE EMPEROR. Netzach is the Chokmah energy at its lowest arc, on the base of the Pillar of Mercy. Its Elohim are the lower expression of the YHVH Elohim of Binah, which the book of Genesis tells us created the Garden and the two Trees. The Path of THE STAR is, thus, the lower Eden, the Eden of the Personality. The Path of THE EMPEROR is, as will later be considered, the fiery aspect of an upper Eden, the Eden from which the Higher Self emerges. THE STAR shows Eden "restored" by Adam, a reference to Tiphareth, to which Adam is attributed. This lower Eden is a state to which the Personality can directly relate. Here, too, we recall that the creation of Man, the formation of the individual consciousness from the collective unconscious, begins from the point of Netzach. It is also the highest level of the Personality's intuition, as opposed to the Path of THE SUN, which is the highest level to be reached by intellect. This resolution is implicit in the very figure of the central Star itself, which is a merging of many lights. It is a shining forth from a central exalted point which has been related to Lucifer. That angel is seen not as an underworld figure, but as the Light-Bearer, the "Morning and Evening Star," usually considered the Planet Venus, the mundane Chakra of Netzach. What is the kabbalah hook angel? What is the path of tzaddi? What are the stars in Tzaddi?